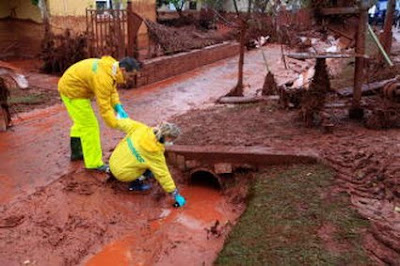 ODESSA, Ukraine -- Toxic red sludge from the burst reservoir of a Hungarian alumina refinery would reach the Ukrainian part of the Danube river in two weeks, the Emergency Ministry said Friday. Meanwhile, Ukrainian specialists are monitoring the situation and carrying out analysis of water from the Danube. Ukraine's Environmental Protection minister Mykola Zlochevsky on Thursday sent an appeal to his Hungarian counterpart, asking for information on efforts to mitigate the aftermath of the accident. The chemical sludge reached the Danube, Europe's second longest river, on Thursday, according to local media reports. That could have a negative affect for all countries through which the river flows: Croatia, Serbia, Romania, Bulgaria, Ukraine and Moldova. According to earlier reports, on Oct. 5, toxic waste poured out of a sludge reservoir at an alumina refinery in the Hungarian town of Ajka, 160 km southwest of Budapest. Five people have been killed, 120 injured, six are missing and eight were hospitalized with serious chemical burns.